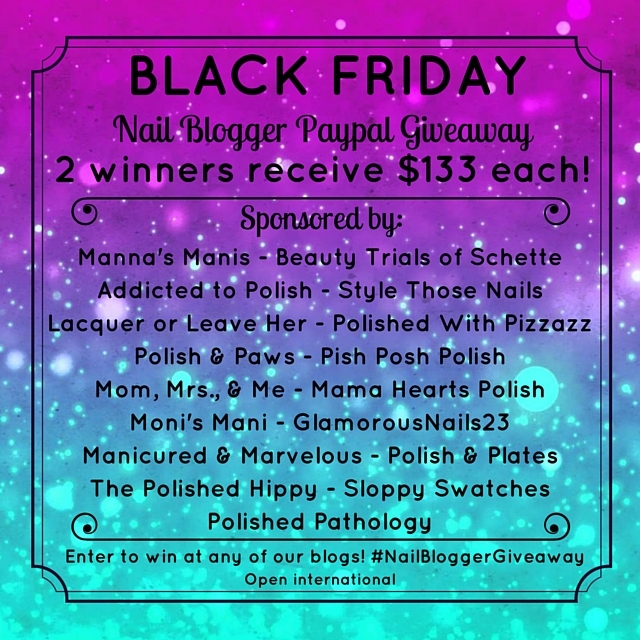 Some of my favorite bloggers have joined forces again to bring you all this epic giveaway just in time for those Black Friday sales! Read on to see the rules and enter for your chance to win! 2 people will win $133 each to their Paypal account. 6. Don't unfollow once giveaways end. It's rude, you will be blocked, and you won't have a chance to enter our future giveaways. 7. Giveaway runs from November 9th - November 23rd. I'd probably embark on an indie shopping spree! I'd finally be able to grab some indies i've been oogling forever but unable to afford! Thank you for the awesome opportunity! I'd most likely use it to buy polish and nail art supplies. I don't own a stamper yet, so that's one of the things I'd purchase.